This is a charming tale from H.G. 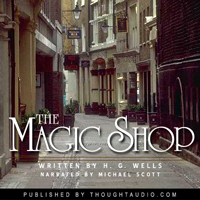 Wells about a young boy named Gip who visits a magic shop for his birthday with his father. But this is not just any magic shop - the shopkeeper insists that this is a genuine magic shop. The story is an entertaining adventure as Gip, like any young boy of his age, experiences the pure enjoyment of true magic while his skeptical father grapples with having to draw the line between slight of hand and genuine magic. Very nice story. Well worded as well as descriptively written. It was a great short story. However the read of the narrator had no variation making it difficult to tell the differences between the characters. This book was very entertaining, especially since it is a well written short story. The narrator sounds a bit automated but was otherwise clear. Bad reader. Very boring voice. Sounds too robotic.